More Americans complain about headaches than any other health condition, including back pain; in fact, approximately 45 million Americans say they suffer headaches each year. That's one in every six people or more than 16 percent of the population. More than 8 million Americans visit their doctor seeking relief for symptoms of headaches each year. Unfortunately, the most popular treatment is over-the-counter pain relievers or prescription medication. There is some good news when it comes to headaches. There are safe and effective natural solutions available to help reduce or eliminate the symptoms of various headache types. For example, chiropractic treatment is a highly sought-after alternative treatment for the debilitating effects associated with headaches. Let's learn about that headache you may be suffering from and how chiropractic can help you get rid of it. Episodic: Headaches appear occasionally, usually less than 15 times per month. Chronic: Headaches occur more than 15 times per month or on a consistent basis. 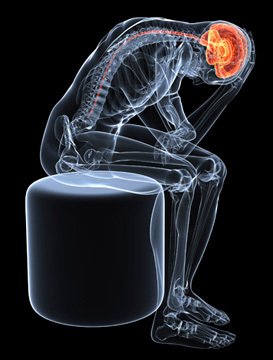 Tension headaches are intimately connected to abnormal posture, muscular tightness, joint stiffness, and restricted range of motion in the body. To obtain optimum health and function, it is important to remember that everything is connected and everything matters. Dysfunctional patterns of movement and posture affect how much tension and stress your body holds. The body must compensate for these dysfunctional patterns by any means necessary, and it accomplishes this by altering tension points. Muscles attach to anchor points on bone and act as primary movers and stabilizers for your body. Mover muscles are used get you from point A to point B, such as a getting up out of a chair. Stabilizer muscles control that movement so you don't fall down while standing up. Abnormal posture and altered tension points on bone anchors puts too much wear and tear on muscles and joints. Your brain and nervous system must compensate for this dysfunction by altering blood flow, muscle movement patterns and breathing. These alterations often lead to tension headaches. Migraines: The second most common type of headache is the migraine headache. Approximately 16-17 percent of the population complains of migraines. These headaches are far more debilitating than the tension-type headaches. More women than men suffer from migraine headaches, leading researchers to believe there may be a hormonal component to migraines. The majority of migraine sufferers report some sort of trigger that kicks of their headaches (food, drink, smell, etc). Chiropractic care can help alleviate the symptoms of tension and migraine headaches by improving and restoring normal postural patterns. Chiropractic treatment is aimed at normalizing muscle tension, restoring joint range of motion, and stabilizing the body to reduce abnormal stressors. Optimizing postural control of the head and neck reduces the workload your muscles must apply just to keep your head up during the day. Proper spinal alignment and muscle control helps give the body a fighting chance of avoiding a tension headache. Proper breathing is essential to relaxation, blood flow, and oxygen supply to the brain and body. Abnormal posture, which can include such dysfunctions as rounded shoulders, neck forward over the shoulders, slouched positions and tightness in the hips from sitting all day, decrease lung capacity. This decreased capacity alters how much you breathe, how often, and from where. Headache sufferers tend to breathe more from their chest and shoulders as opposed to their diaphragm. This leads to repeated elevation of the shoulders and upper back muscles hundreds of times a day, leading to increased tension in the head and neck. Chiropractic restores function to the spine, ribs, and hips to maximize breathing and good postural control. Better breathing equals better health. If you're suffering from headaches and are tired of taking pain-relieving medication day after day, your doctor of chiropractic will work closely with you to determine likely triggers for your headaches and make subtle changes in your activities of daily living to empower you to take back control of your life.